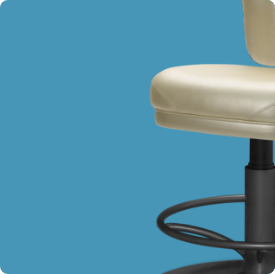 Gasser Chair Co., Inc. (herein the “Company”) offers a limited warranty on the workmanship and materials of its commercial seating products known as the Gasser “Trademark” brand, when maintained and operated under normal conditions. This warranty, subject to the excluded items and/or exceptions listed herein, extends over a period of ten (10) years, commencing with the shipping date of the covered product, and is limited to the original Buyer or first user. Booth seating, folding chairs, folding tables, storage carts, hand trucks, accessory items, table tops, table bases, swivel units, glides, gas charged cylinders, adjustable seat or back mechanisms and controls, casters and all products and/or components not identified and known as Gasser “Trademark”, “Club Collection” or “Design Trac” and “QSI” brands all of which are subject to a one (1) year limited warranty, commencing with the shipping date of the covered product and limited to the original user. Commercial seating products known as the “Proven Solutions” brand are subject to a one (1) year limited warranty period on the workmanship and materials, commencing with the shipping date of the covered product and limited to the original user. The warranty period on “Proven Solutions” brand products may be subject to change based on the agreed upon terms of sale at the time of purchase. All upholstery materials and laminates are expressly excluded from any Gasser Chair Co., Inc. warranty, but may be subject to warranties directly from manufacturers of upholstery materials or laminates. Gasser Chair Co., Inc. reserves the right to examine and determine the cause of a claimed defect and/or need for repair. This limited warranty does not cover and specifically excludes any claimed defects and/or need for repairs resulting from normal wear and tear, abuse, neglect, improper installation, faulty maintenance, accidental or intentional damage, foreseeable and unforeseeable misuses, material alterations made by Third-Parties, damage from fire, floods, earthquakes or other acts of God and/or defects resulting from the Company’s compliance with the original user’s specifications. THERE ARE NO OTHER WARRANTIES, EITHER EXPRESS OR IMPLIED, WHICH EXTEND BEYOND THE TERMS AND CONDITIONS CONTAINED HEREIN. THE COMPANY HEREBY DISCLAIMS ANY IMPLIEDWARRANTIES OF MERCHANTABILITY AND FITNESS FOR A PARTICULAR PURPOSE OR OTHERWISE. BUYER AGREES AND ACKNOWLEDGES THAT IN NO EVENT SHALL GASSER CHAIR CO., INC. BE LIABLE TO BUYER OR TO ANY THIRD PARTY FOR ANY GENERAL, SPECIAL, CONSEQUENTIAL OR INCIDENTAL DAMAGES OR LOSSES. Any Gasser Chair Co., Inc. products suspected of being defective, unsafe, or in a condition that might cause personal injury, must be immediately removed from service. Buyer shall also increase the frequency of periodic inspections if the suspected defective and/or unsafe condition is suspected to be a common condition in more than one good. For assistance with warranty claims, contact: Gasser Chair Co., Inc.